Tata Motors announced a set of stupendous records in a 18-day, non-stop high-speed drive with its three cars – Zest, Bolt and the upcoming Tiago – on the 4.2 km long NCAT (National Centre of Automotive Testing) high-speed test track at the Vehicle Research & Development Establishment (VRDE), a DRDO (Defence Research & Development Organization) facility in Ahmednagar. The new generation cars underwent the ultimate endurance run in scorching temperatures for the #GearedForGreat Challenge and achieved multiple record-breaking distances culminating at 50,000km each with an average speed of around 120 kmph, succesfully clocking a staggering 360 records in a single event (Please refer Anexure 1 for record details) – the first ever by any Indian OEM. Tata Motors‘ triumphant celebration came with four of its new generation cars, the petrol versions of Zest and Bolt; and the petrol and diesel versions of the soon to be launched,Tiago. Conducted under the aegis of the Federation of Motor Sports Clubs of India (FMSCI), the sanctioning body in India for the FIA (Fédération Internationale de l’Automobile – the world body for motorsport), the #GearedForGreat endurance challenge has been designed and developed in partnership with ZEEGNITION as an independent auto expert testing the cars, backed by the Indian Oil Corporation of India (IOCL) and JK Tyres. Tata Motors embarked on a grueling endurance and a mileage run from 14h March, 2016 with the cars randomly picked from its plant and put them to test to prove their capability. All four cars cars started strongly, first dispatching all existing records for 24 hours with the Bolt storming through to a new Indian mark of 3161km at an average speed of 131.7km/h. From here on it was all about setting new benchmarks on the tough 4.2 km high-speed circuit with all four corners featuring steeply banked curves of varying degrees that put the cars to the severest tests while also allowing them to run flat out. The basic structure of the cars coupled to their engineering design and build plus the efficacy of the suspension geometry greatly aided the ride and handling of the cars to enable their drivers to be both safe and comfortable as they drove at high speed lap after lap, day and night. Apart from short pit stops every 2 hours for driver changes, fuel fill-ups, routine checks, and cleaning of the windshield/ headlamps, the 4 cars racked up the kilometers at a scorching pace of 130 -140 kmph. Today, all four cars have completed the 50,000 km mark in record time, offering a remarkable validation of the new Tata Motors processes that are bringing these new-generation cars to the market. Each of the record-breaking cars covered more than 11832 laps of the NCAT circuit, testing the powertrain, suspension, electronic components and body structure to the hilt and beyond. Adding up the distances covered by all four cars gives an impressive total of 200,000 kilometres – which is 5 times the distance around the circumference of the Earth. The severe stresses put on every major aggregates of the cars considering they were driven at speeds of around 160km/h even approaching the banked curves clearly marked out the stability and road holding of the cars, the suspension and the tyres (by our partner JK Tyres) being markedly on top of all challenges posed by the speed of the cars and the nature of the circuit. Despite the extreme stress, the new engines – The Revotron 1.2T, the Revotron 1.2L and the Revotorq 1.05L held up magnificently over the entire record distance without any deterioration in performance – further testimony to the reliability and durability of the high-tech, indigenously developed engines from Tata Motors. Besides the endurance test, another four cars of the same description as the Endurance cars, also ran at a constant pace of 45-55km/h until each ran out of fuel to establish a radical fuel economy figure. The Zest and Bolt clocked-in an impressive mileage of 29.89 kmpl and 28.32 kmpl respectively, monitored under the ideal conditions, to show what state‑of-the-art vehicle technology can achieve. Tata Motors will announce the Tiago fuel economy test results at the car’s launch event. An individual normally covers a distance of 50,000 km, in 3-5 years and it is almost impossible for an average Indian automotive consumer to consistently achieve average speeds beyond 130km/h for a serious length of time. This record run is real testament to the durability, safety and performance of the new generation Tata cars in extreme conditions, way beyond what a normal driver would experience. The major records achieved are testimony to the perfect blend of pioneering technology and tremendous sporting ability at the wheel. 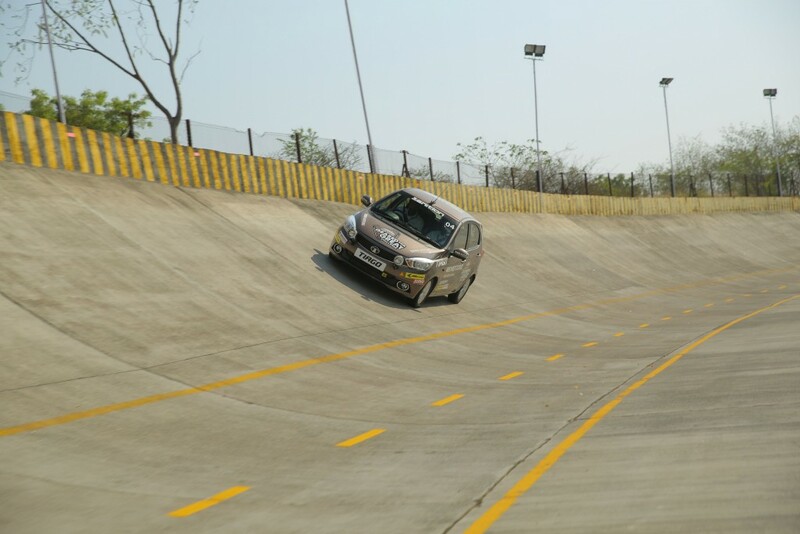 The sporting and technological conduct of the event was in the hands of Godspeed Racing run under the NCR (National Competition Rules) of the FMSCI (Federation of Motor Sports Clubs of India). The participating vehicles were scrutineered at the Tata Motors plant in Pune by FMSCI officials before they left for VRDE by road. All vehicles were in OE stock condition, except for safety fitments such as an emergency engine kill switch, auxiliary driving lamps and a fire extinguisher. More so, all four cars were homologated by the FMSCI as one of the pre-requisites for a record attempt run under the NCR. Over 60 professional drivers, racers and auto experts from 22 cities from all corners of India, participated in this mega event to push these cars to their limits. The pit stops were efficiently managed by a team of engineers and technicians from Tata Motors, and ably assisted by teams from JK Tyres / JK Motorsports, and IOCL (Indian Oil Corporation Ltd). Working with the tyre supplier, J K Tyre, Tata Motors’ priority was to minimise risks and enhance vehicle performance and driver comfort. The team worked closely with J K Tyre right from the start to ensure that the new generation cars could run the desired course on JK’s latest generation tyres. The crew worked closely with Tata Motors’ own technical team to undertake quick and efficient re-fueling and driver changes, day and night. The ZEST, BOLT and TIAGO represent the new face of Tata Motors and come with advanced technology and features, which places them class apart, in their respective segments. Whether it was the launch of India’s first turbo-charged, Revotron 1.2T petrol engine, the compact Revotorq 1.05L diesel engine, the first diesel AMT, the first-in-segment multi-drive mode, the high-end infotainment system from Harman, or the intelligent & intuitive design of the TIAGO, these cars are examples of the innovative products to come from the company. Tata Motors is focusing on introducing technologies, which are future-ready, innovative and is offering rich features in its cars, which have been highly appreciated by customers.